Photos by Vince Compagnone Several months ago, Deep Purple and Fleetwood Mac toured the U.S. with a comparatively unknown group/guitarist named Rory Gallagher. “He stole the show,” explained many people afterwards. As I was unable to spend my money or time at the Sports Arena, I just took their words as their opinions. Little did I know that a few weeks later….. 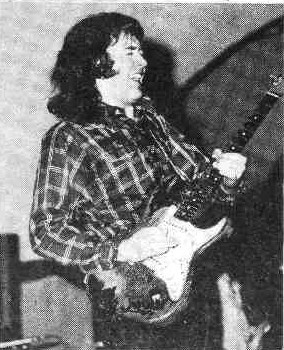 The last concert of the year at San Diego State featured Rory Gallagher in Montezuma Hall. It was free to students, so…..penniless and enrolled, I decided to go. An interview seemed appropriate, so, with Vince, camera, and tape recorder, we went up the hill to that great institution in the sky. Rory took the stage as though he had lived there most of his life. Many of his songs were “jams,” which quietly built up to an explosion of sound and energy, unlike anything I had ever seen. High energy rock and roll? The group played for over an hour and a half, displaying much of what Rory is known for – all sorts of guitar (speed, slide, blues, mandolin playing, and blues harp). “It's called a mandola,” Rory corrected. “…..A long neck electric mandolin. I just play guitar, harmonica, mandolin, sax, and a bit of banjo. 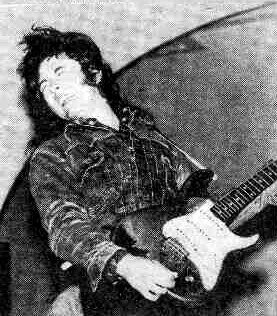 The band was composed of Rory on guitar, and so on, a bass player, electric pianist, and drummer. As I would soon find out, Rory was born and grew up in County Cork, Ireland. It was obvious that his musical background was much different from that of many other known guitarists. “In Ireland, you have all this traditional Irish folk music as an influence. There's a skiffle singer from Scotland named Lonnie Donegan who was my first big favorite. He did songs by Woody Guthrie and Ramblin’ Jack Elliot. "I don't think music was that different than here. There was less of those singing groups like Clovers and so on. It was more of the one man type artist who was popular. Buddy Holly and Eddie Cochran – it's like they never died over there, in a sense." “America eats up an artist sooner and it kills them sooner, but the English or European people are a lot lazier about it. They like to hang on to an artist for years, even when he is dead. I speak to a lot of people here in the U.S. about Buddy Holly. It registers only in a very minor way. The ‘average’ American rock fan doesn't know much about him. The ‘average’ is not you or me, but the person who listens mostly to the radio. He/she would remember Buddy Holly more for his glasses than his songs. It seems to me that they would remember hearing his song at the high school hop or something. It seemed strange that Rory and his group would play in such a small place. It was very different for me, as a concert-goer, to stand less than thirty feet away from a “rock-star” and enjoy seeing and hearing the performance. I had read and heard that Rory Gallagher was very popular in Europe, but I was sure that he was not well known in the U.S.
Several rock writers had reviewed an album called Jerry Lee Lewis “Session” which features Peter Frampton, Alvin Lee, Rory Gallagher, and others as “session men.” Rory plays lead on three tracks, and shares it with Alvin Lee on “Drinking Wine Spo-Dee-O-Dee.” I wondered how recording with Jerry Lee was. “It was good, but he's absolutely a non-rehearsal man. I played on four songs, and I'm sure we did them once and then taped ‘em. I'm sure one song I didn't even rehearse. He just shouted the key at everyone and then off we went and that's it. 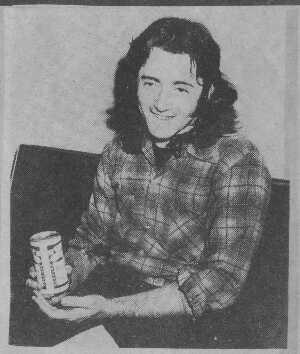 It would be impossible to guess if Rory Gallagher will be known fifteen or twenty years from now, like Buddy Holly and others like him. Different record companies spend huge amounts of money advertising their “artists.” (The door even gets a little bit.) The larger a company is, the more full page ads you see in Rolling Stone. (If you can afford it.) Polydor is a relatively small label, when compared to the “Big C.” How did Rory wind up on Polydor? The last number was being performed and the audience was on its feet. There's Mr. Jelly wondering what is happening. “Long time no see.” Could this crowd of twelve to fourteen hundred college folks be representative of the rest of the United (sic) States? 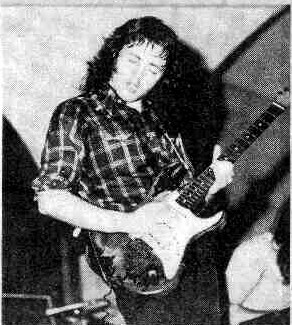 Rory Gallagher is certainly able to “do all right” in concert, as he and the audience proved that night. He is one of the most creative rock artists since Jimi, and is equally exciting live. Thanks to Doug Pugh for sending it along.